The Chicago Tribune is reporting that a bicyclist was struck and killed by a semi-truck this morning on Wells Street just north of Oak Street. The bicyclist has been identified as Neill Townsend, 32, of Chicago. According to witnesses and police, Neill was in the southbound lane of Wells Street in front of Walter Payton High School when the door of a parked car suddenly opened directly in the path of the bicycle. According to police, Neill tried to swerve to avoid hitting the open car door. As the bicyclist tried to swerve he fell to the street and was struck by a passing semi-truck. There is a clearly defined bike lane on Wells Street at this intersection. The Illinois Vehicle Code provides that “no person shall open the door of a vehicle on the side available to moving traffic unless and until it is reasonably safe to do so, and can be done without interfering with the movement of other traffic, nor shall any person leave a door open on the side of a vehicle available to moving traffic for a period of time longer than necessary to load or unload passengers.” (625 ILCS 5/11-1407) Thus, the vehicle occupant that opened the door in the bicyclist’s path could be liable for the fatal bicycle accident. This is a very tragic bicycle accident that could have been prevented. Obviously the driver should not have opened their door into the path of traffic, in this case the bicyclist. In addition, the truck arguably should not have been following so closely that it couldn't stop prior to impact. 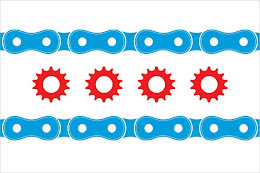 Section 9-36-010(c) of the Chicago Municipal Code requires motor vehicles attempting to pass a bicyclist traveling in the same direction to leave a minimum of three feet between the vehicle and the bicyclist.